Appearance: Elath is 5'10" tall, weighs 150 pounds, and has an athletic muscular build. 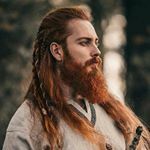 He looks fairly average for an Inarta, with pale white skin, long red hair that he wears braided in the middle, and eyes that share the same shade of blue as the sky that he loves so much. Elath is a Chiet who has had a life-long goal of becoming an Endal. He is pretty arrogant, as he feels that due to his devotion and training he will one day be the best Endal in all of Wind Reach. Elath also has a strong fondness of the opposite gender, and is known to be a bit of a flirt. Elath's past is an interesting one. His parents were both of the Chiet caste, and they lived a happy life together. However, his mother died during child birth, even though Inarta women are known for being strong child bearers. The death of Elath's mother inspired his father to do everything he could to become an Endal, so that he could honor his beloved in her passing. Elath grew up with all the other children of Wind Reach, and his father only spoke to him a scarce number of times. Elath wanted to be just like his father though, and has always dreamed of becoming an Endal, so that he may make his father proud. While out hunting one day, Elath had stopped to try to do some falconry training with his raven Twilight. During this training session, which was not going very well, Elath heard the sound of heavy wings flapping in the sky. He glanced up and saw a magnificent Wind Eagle, with a beautiful girl upon her back. The girl stopped and spoke to Elath for a while before continuing with her own hunting. Elath ran into the girl some time later back in Wind Reach, and the two hit it off. The two started speaking as much as possible, at least as much as the Endal girl could fit into her schedule. They fell in love, and Elath began accompanying her on hunts, since he had become quite competent with a crossbow. It was on these hunts that Elath began to learn the ways of the Endal, picking up bits and pieces of Wind Eagle riding and care. However, as is the course of love, Elath and the Endal girl slowly drifted apart. As the two fell out of love, the hunting trips together ended, leaving Elath as a ground dweller once more. Now, with his handiness with a crossbow, and his knowledge of riding, Elath continues his journey towards becoming an Endal, and he is even more determined now than he was as a younger man. Heirloom: "Twilight" the Raven. Given to him by his father upon one of the very few times he spoke with him during his life. Belonged to his mother before her passing. No current or past threads in Mizahar. New player here! "I've always loved the sky. It's as if it's a living being, and it has been calling to me for all of my life."